This lovely little church dedicated to St. Nicholas of Myra stands in a circular churchyard, suggesting that the site was in use before the Christian era. 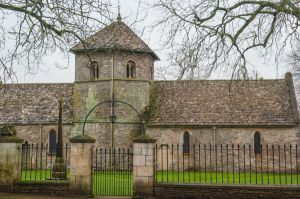 The church is Norman, first mentioned in 1131, with a peculiar hexagonal central tower topped by a pyramidal roof. The tower base may have begun as the nave of a chapel. The building was then extended to the east and west with the addition of a nave and chancel. Though the tower is generally regarded as 12th century, an alternate theory has suggested that it actually dates back to the Saxon era. Certainly, the round-headed windows in the upper stage are indicative of great age. You enter the church through the south doorway, a wonderfully carved piece of 13th-century craftsmanship, with intricate designs and beautiful detail. 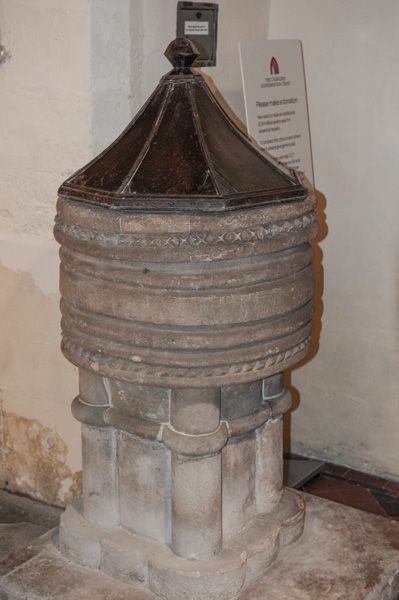 Also 13th century is the font, decidedly simpler in design. One small fragment of medieval glass remains, in the east window. Equally interesting are four panels of 16th century Flemish glass in the tower. The interior presents a startling contrast to the ancient exterior, being almost entirely the result of a Victorian rebuilding. You have to park outside the gates of Ozleworth Park and follow a signed path downhill, past the manor house, to the church, a walk of no more than 5 minutes. The entrance is on the far side of the church, a fact that momentarily confused us as we tried in vain to open the locked north chancel door. Just walk around the west end of the church to the south porch. The first sight that greets you on entering the porch is the quite astonishing south doorway. On seeing it I instantly labelled it Victorian, because the intricate carving was so detailed, so deep-cut and crisp that I thought it could not possibly be original medieval work. Oh, yes it could! The doorway, and the 13th-century west tower arch that greets you inside the church are absolutely stunning in their quality of carving. I think these are among the best medieval pieces of stonework in any Gloucestershire church, and well worth a special trip to see. Other interior highlights that caught my eye include the 13th-century font beside the door and an ancient stone coffin under the west window. The excellent church guide suggests that it might be Saxon, or at least early Norman. 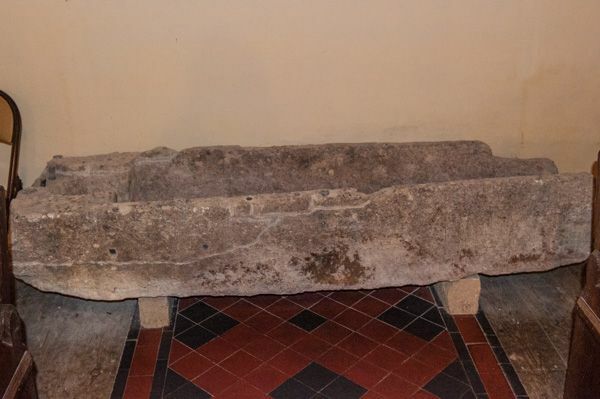 There are several ancient pieces of furniture under the tower, including a small carved chest that appears Jacobean. Above this is the tower window with 16th-century Flemish glass. 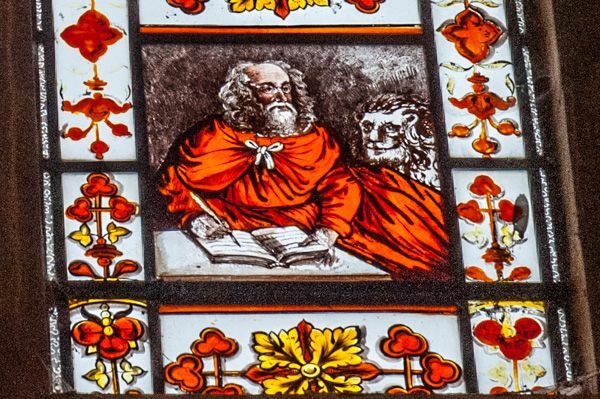 The detail of this glass is wonderful, and like much Flemish glass, it makes heavy use of rich orange colours. Look for the demon peering over the shoulder of a man in the lower right panel. 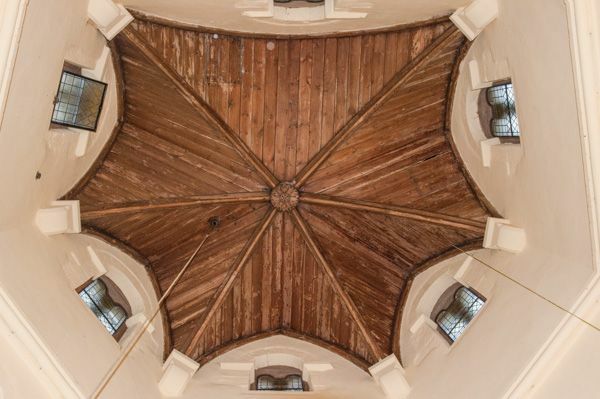 Stand in the centre of the tower and crane your neck back to see the tower roof where it divides into 8 faces high above. 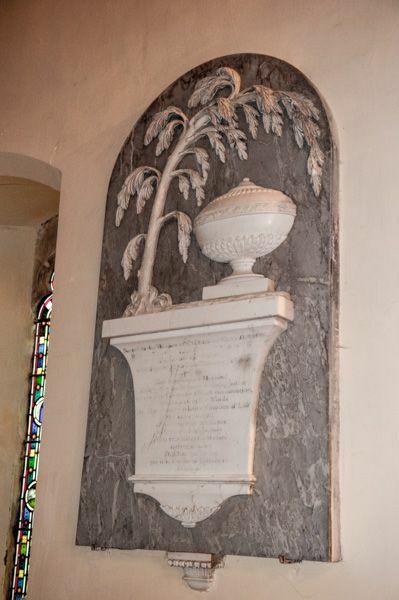 There are several interesting monuments in the chancel, including one to Catherine Clutterbuck (d. 1807) with a leafy frond drooping languidly over a funerary urn. Nearby is a memorial to Lewis Clutterbuck (d. 1820) who served as rector of Ozleworth for 50 years. 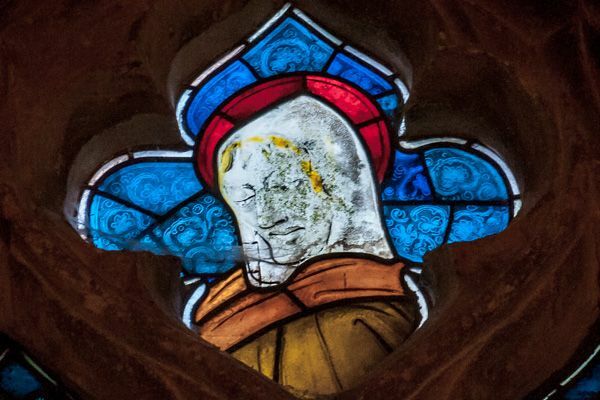 At the apex of the east window is a quatrefoil light containing the only medieval glass in the church, depicting a man with a halo peering down over his left shoulder, as if dropping the viewer a sly wink. To say that I loved Ozleworth church is an understatement; there is so much of historic interest here, the secluded rural setting beside the manor is wonderful, and the carving over the south door and tower arch can rank with the best from this period anywhere in Britain. St Nicholas church is no longer in regular use and is cared for by the Churches Conservation Trust, and it is open daylight hours. Just a short distance away is the historic manor of Newark Park.